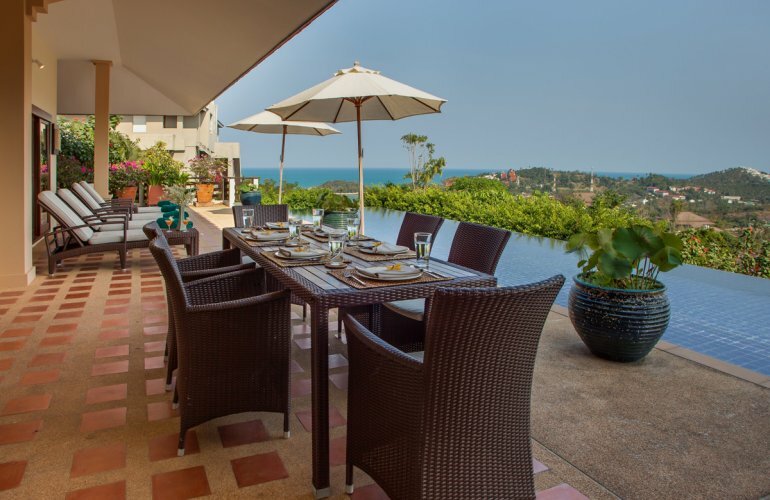 An exclusive five bedroom villa overlooking the island's beautiful coastline and the Gulf of Thailand, nestling snugly into its tropical hillside garden on three carefully planned levels, this charming holiday home is located in a gated community on the north east coast of Koh Samui. Staying here offers guests secure exclusivity, expansive views, indoor and outdoor dining options and a private infinity edge lap pool with sun terrace. It is a two minute drive to the closest beach at Choeng Mon with several beachside bars and restaurants; the airport, Chaweng, and the quaint Fisherman's Village at Bophut, are all ten minutes' drive. The main entrance to the upper level of the villa is reached via steps leading from the car port. Once inside, the large open plan living area, incorporating lounge, dining room and kitchen, invites a thorough appreciation of the breathtaking views of the hills and coastline offered through the sliding doors which open out onto the sun terrace and the pool. Together with the terracotta tiled flooring, separate mosquito screens and refreshing ceiling fans, this area stays comfortable throughout the day. Ample seating on two sofas is provided in the vaulted ceiling living room, and a dining table for six faces the pool terrace. The western-style well equipped kitchen, including a breakfast bar, a fridge freezer with water and ice dispenser and gas oven and hob, provides all you might need to refresh your friends and family with drinks and light meals. There is a guest bathroom on this level of the villa. The sun terrace around the 15m infinity edge pool is partially covered, allowing shady relaxation as well as full sunbathing on the soft sun loungers, while enjoying the views. There are large sun parasols for use with the sun beds, and another dining table with six chairs for al fresco meals. The master bedroom suite is housed in its own pavilion at one end of the pool deck and enjoys the same wonderful views as the pool. It has a king size bed and good sized built in wardrobes. A small passage leads to a choice of indoor or outdoor sandstone tiled en suite facilities, with a shower enclosure and an open-air bathtub with rain shower. The next level down of the villa, the central floor, offers a spacious dedicated AV den with cosy sofa seating, satellite TV/DVD and surround sound. This room has windows onto the villa itself but not to the exterior. The fifth en suite bedroom is located on this floor. It has a queen size bed, en suite rain-shower bathroom, and its own balcony overlooking the landscaped and lawned garden. Another flight of steps leads down to the remaining three bedrooms, all of which open out directly onto private terraces by the lawn. The second master bedroom is slightly separated in a far corner of this floor, and has a king size bed and en suite with glass walled rain shower room. Finally, the last two guest bedrooms share a connecting bathroom, and have one king size bed, and two twin beds.